and we were amazed at how much the colors have changed in just one week. 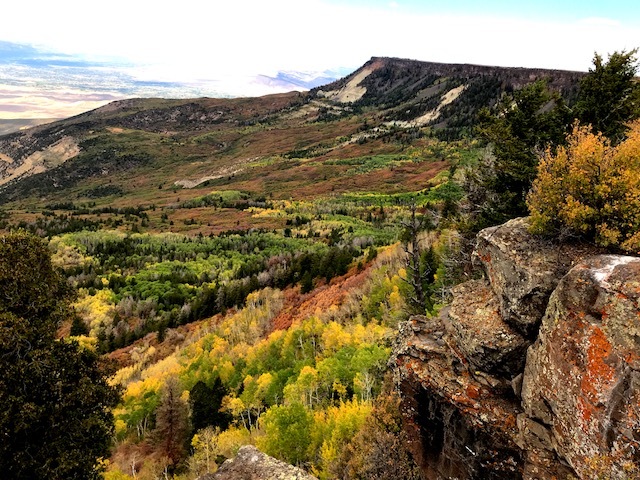 The Grand Mesa is “known as the largest flattop mountain in the world, encompassing hundreds of square miles and standing more than 10,000 feet above sea level. 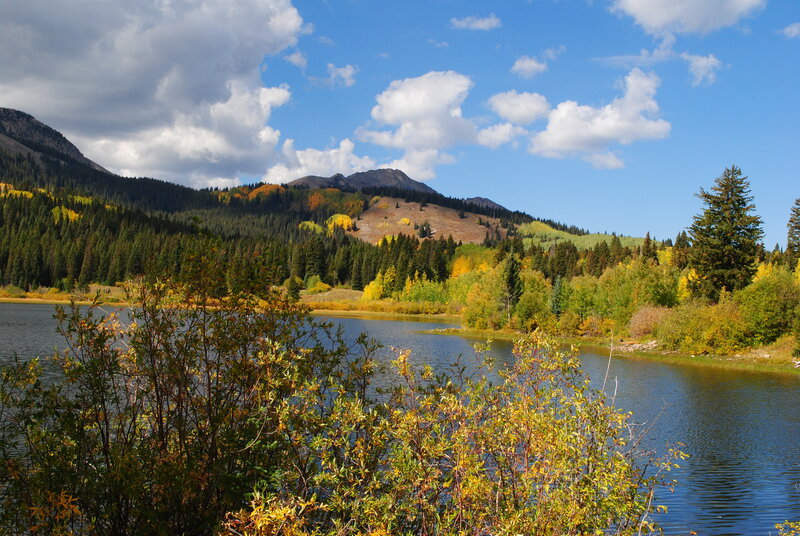 The Grand Mesa scenic byway leads through old-growth forests, aspens, meadows and so many lakes you’ll lose track”. 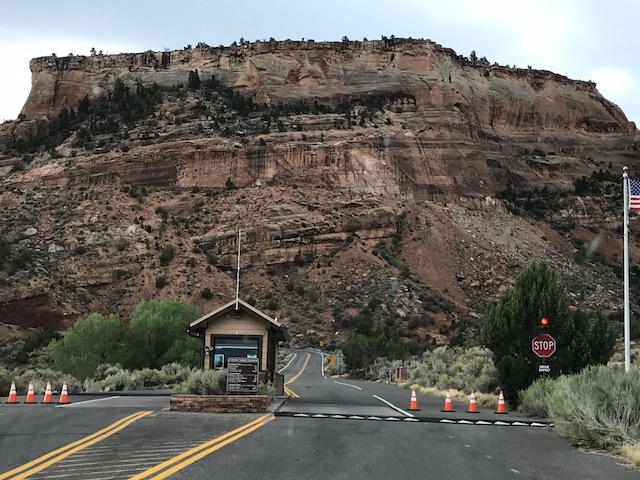 We drove out to what is called Lands End Observatory, a ranger observatory on the rim of the Grand Mesa. The views from Lands End Observatory are spectacular, and there are lots of little critters running all over the rocks (look closely in the middle of the rock below) looking for special treats that visitors might put out for them. 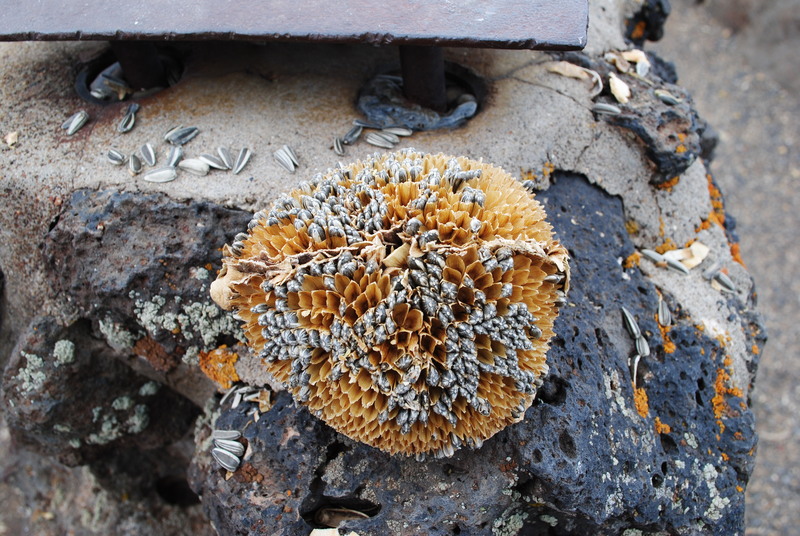 Some visitors bring huge sunflower pods filled with sunflower seeds, and leave them out for the critters to find and enjoy. We had a special treat at Lands End Observatory too. Katie packed a wonderful picnic lunch that we all enjoyed while taking in the million dollar views. Thank-you Katie Roden, for treating us to such a beautiful, fun-filled day. Our time here in Colorado is quickly coming to an end. 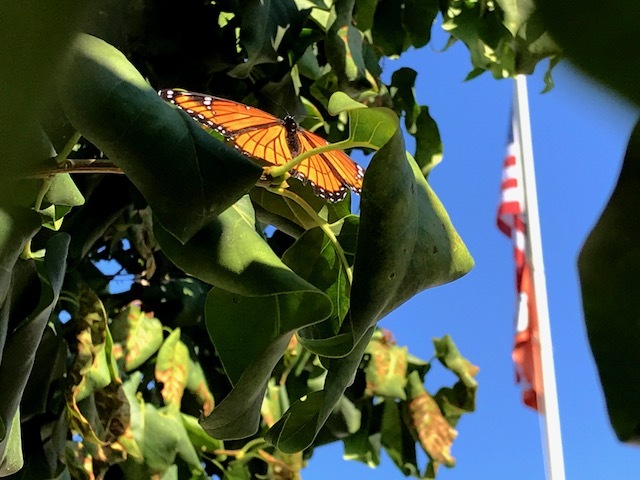 We leave Saturday to make our way back to Arizona, where we are excited to see our family and friends there, and enjoy another exciting season hosting at the Visitor Center at McDowell Mountain Regional Park. 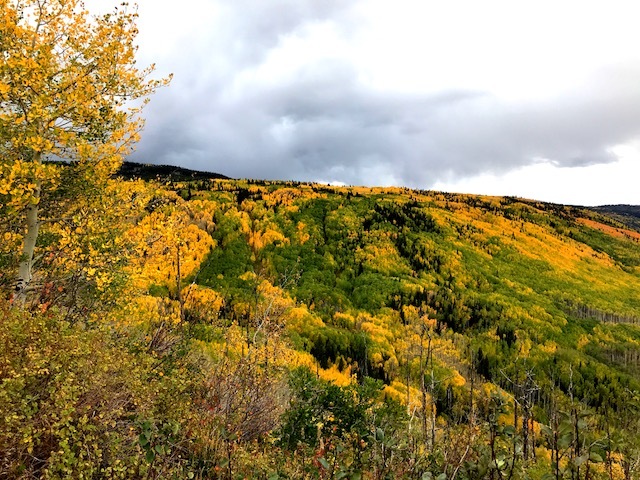 This week our son Pat, and daughter-in-law Celina, took us on a spectacular drive to see the fall colors on our way to visit Crested Butte, Colorado. About an hour into our drive, we started seeing the beginning of the leaves changing colors. and in some areas, we even saw hints of red. 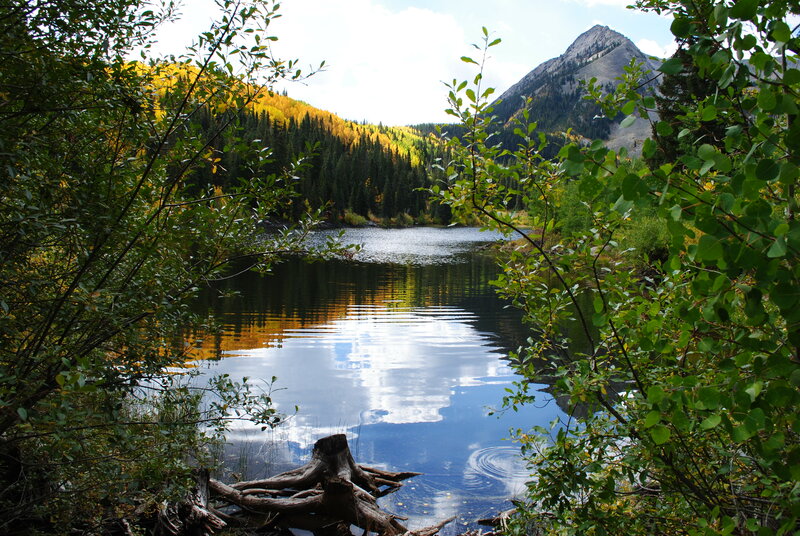 Before we made our way into Crested Butte, we stopped at a beautiful lake named Lost Lake. 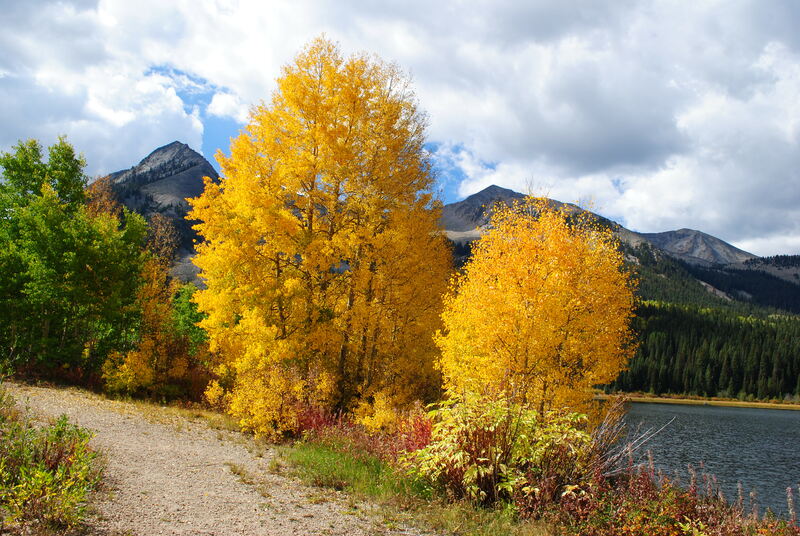 Oh, Shantel, all the beautiful colors of the changing leaves were also being reflected off the still water of the lake. So as we were looking at the leaves on the trees around the lake, we were also seeing their image reflected on the water. Even the clouds in the sky were reflecting on the water. All of these images created a peaceful, calming, feeling. 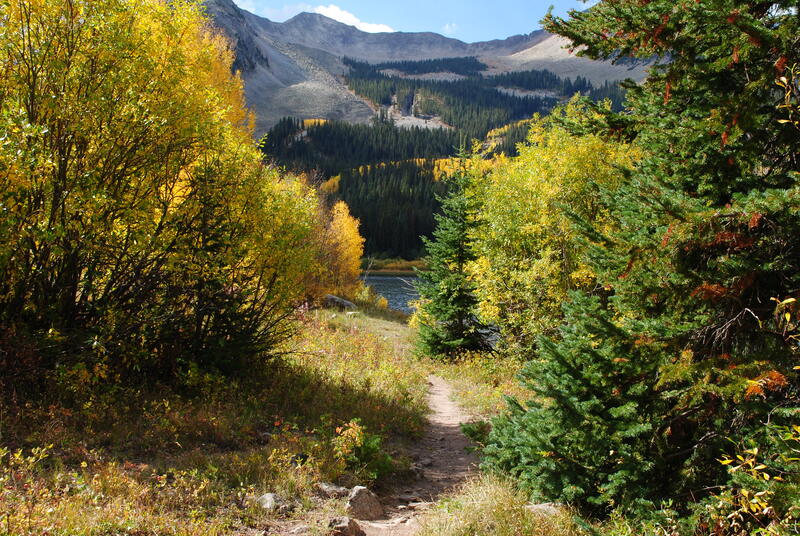 and around every curve of the trail was a scene more beautiful than the last. 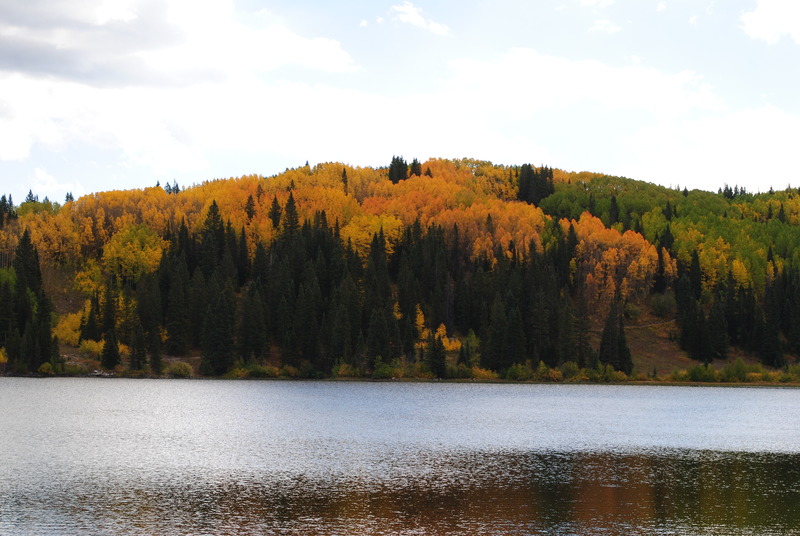 In the next picture, we were looking across the lake at trees displaying every shade of color. And in this next picture the clouds were moving across the lake creating shadows that reflected off the water. 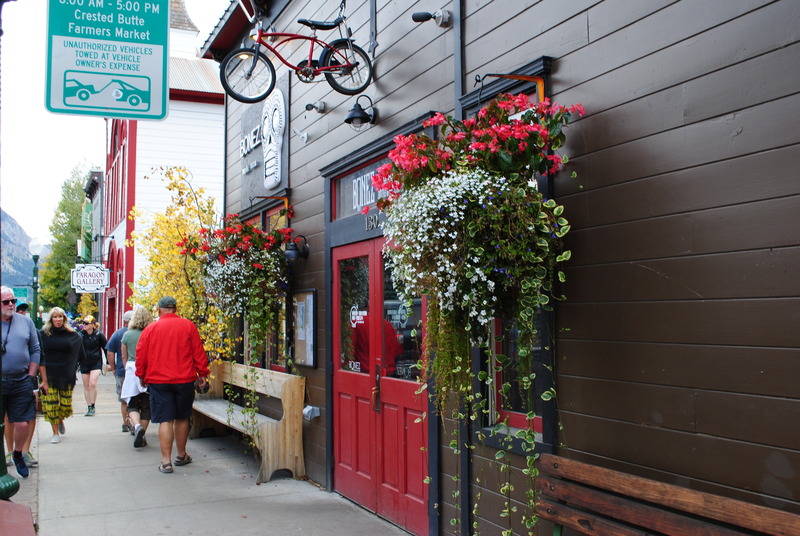 We left the lake and made our way into Crested Butte. 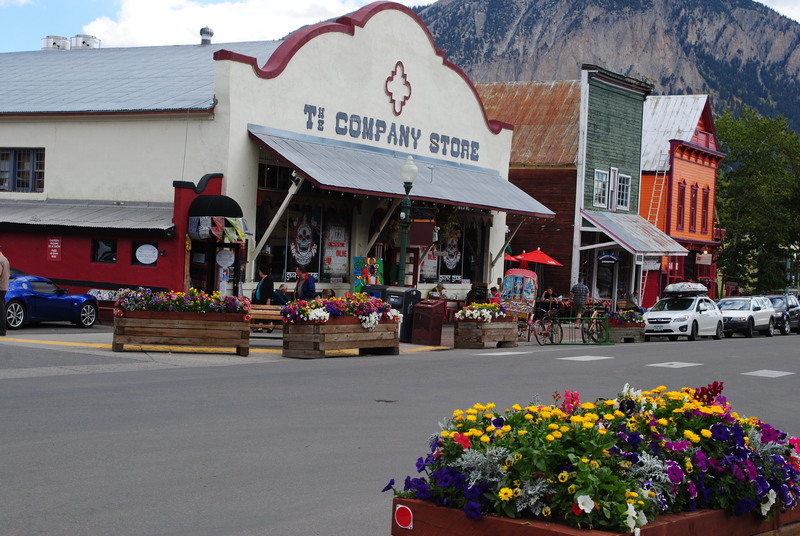 What an adorable, colorful, little town. 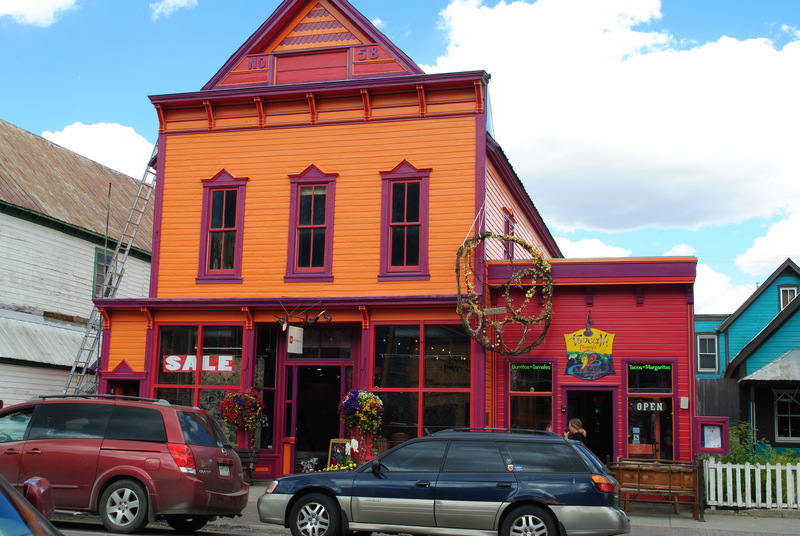 Every building in the town is painted a different color. Orange, red, blue, and green, just like the colorful leaves on the trees. And they have the most beautiful flowers planted in big flower beds and hanging pots all along the street and sidewalks. Aside from the magnificent colors we saw in the fall colors of the trees, the highlight of the trip for me, was when we visited a little mini donut shop where they make mini donuts fresh right in front of you, and they come with hot toppings of your choice. 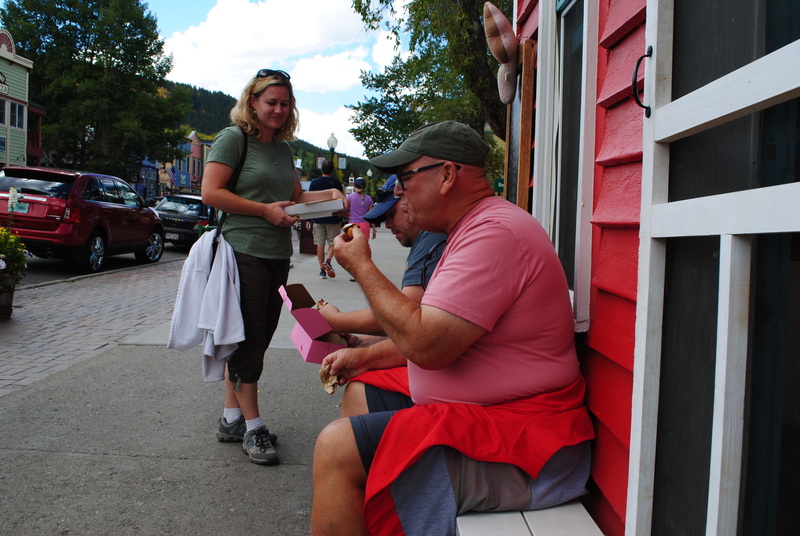 Papa and Pat bought six of the donuts with a variety of toppings, like hot caramel/bacon to name just one. 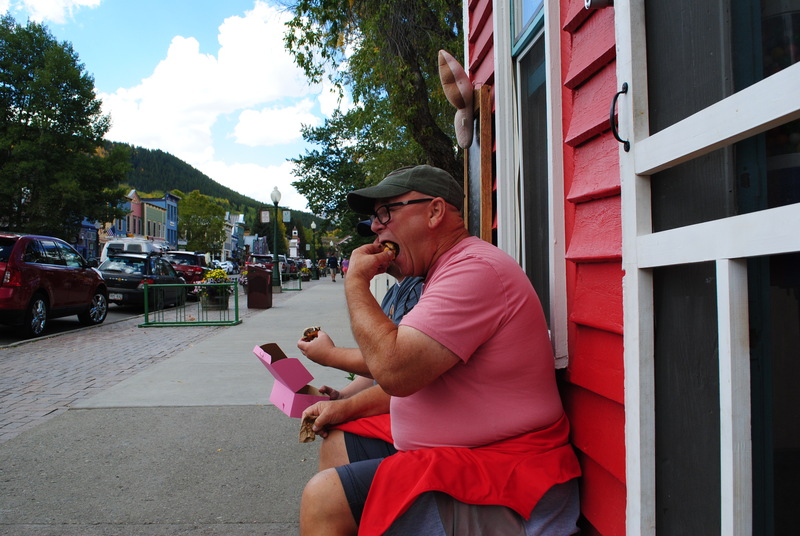 Then, they sat outside the donut shop on a bench and ate all the donuts. But the look on their faces as they enjoyed their sweet treats just made my day. As you know I don’t eat sweets, and Celina didn’t have any either, but she stood close by and kept handing Papa and Pat napkins to wipe their hands and face after they finished each of the six donuts. I got so tickled watching them, I could hardly hold the camera straight to take some pictures. “My good people as you pass by, as you are now so once was I. 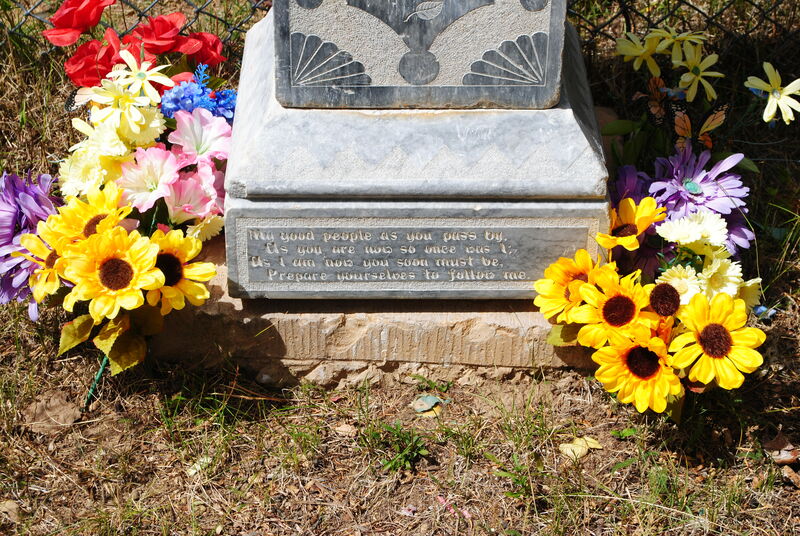 As I am now you soon must be, prepare yourselves to follow me.” I thought that was a profound message on a gravesite headstone, so I included a picture of it here on my blog as a reminder to enjoy every minute of your life, and especially enjoy the donuts! 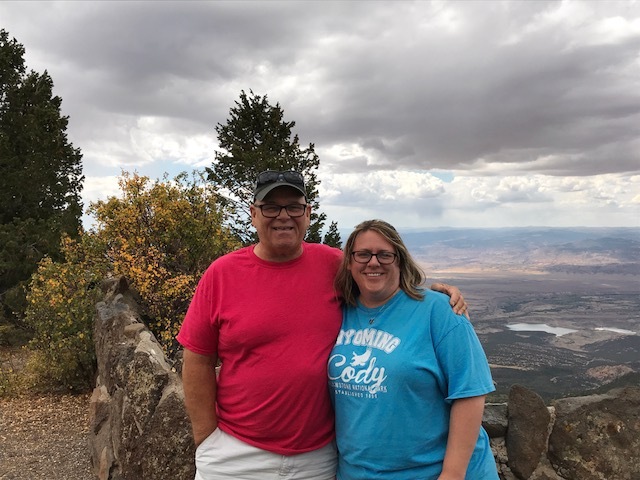 Big thanks to Pat and Celina for taking us on such a beautiful drive and spending their day showing us around Crested Butte, Colorado. 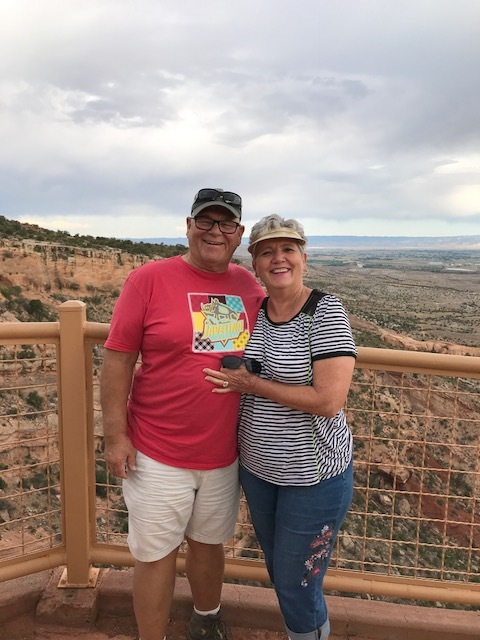 Yesterday our son, Pat, and daughter-in-law, Celina, took us to visit Canyonlands National Park, and Arches National Park in Utah. 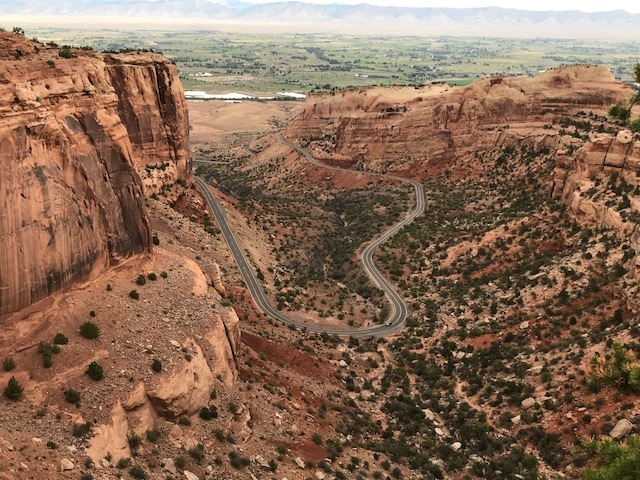 We left Fruita, Colorado and took a beautiful scenic drive to Moab. For our daughter, Shantel, I will do my best to describe the beautiful scenery we saw. 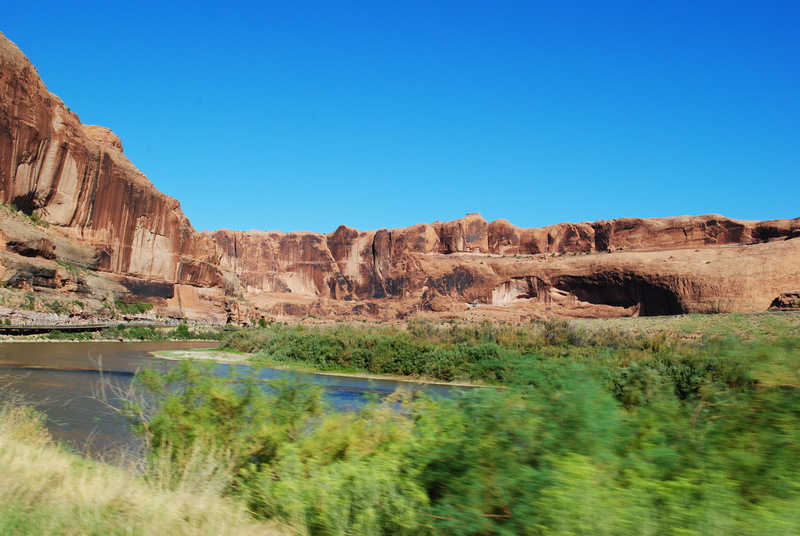 The scenic drive took us through an amazing canyon that follows the Colorado river. 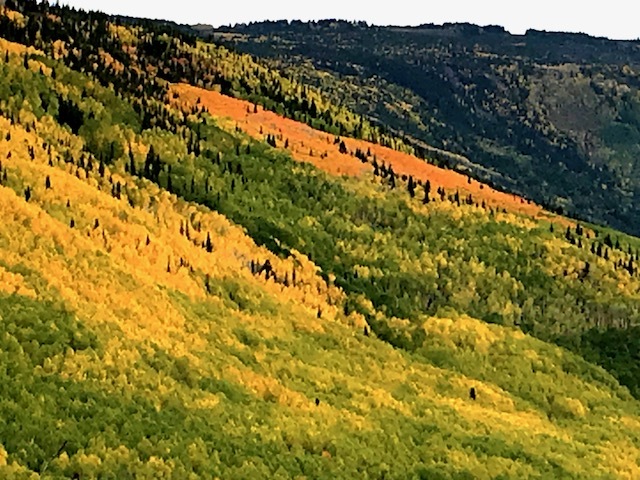 The mountain colors are almost beyond what I have words for, because they have multiple shades of color. Shades of red, blue, white and hues of everything in between. 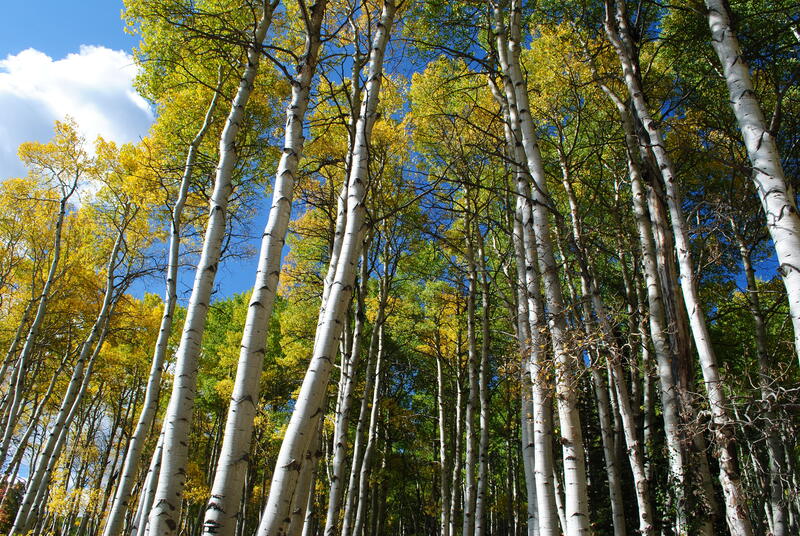 And, in some areas, they stand majestic against the deep blue sky, green grass, and trees that surround them. 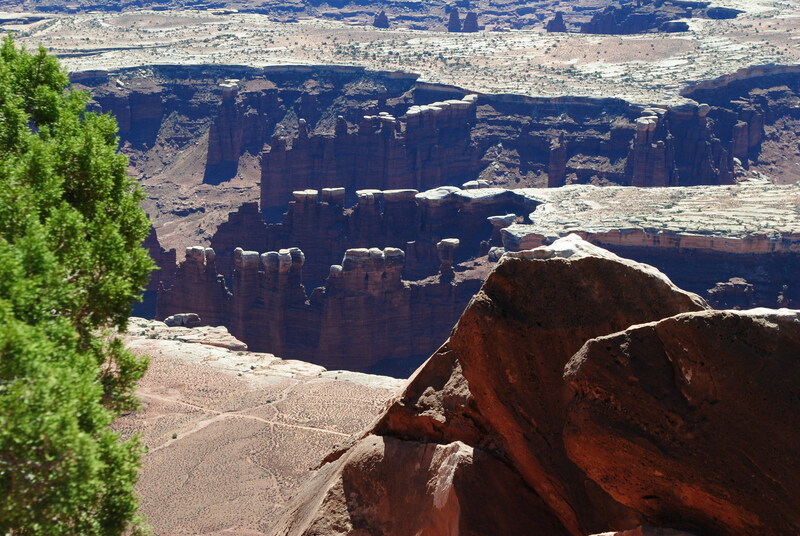 From Moab, we made our way to Canyonlands National Park. 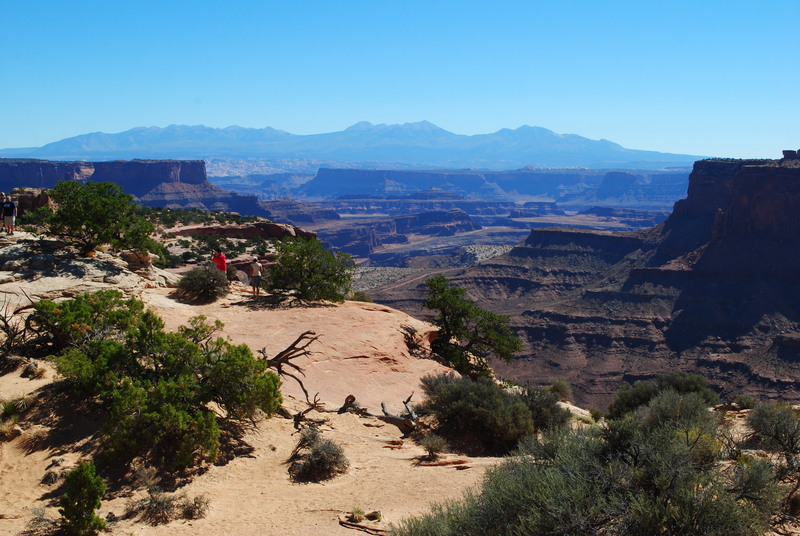 The information we received when we entered this National Park says “Canyonlands National Park preserves 337,598 acres of colorful canyons, mesas, buttes, fins, arches, and spires in the heart of southeast desert. Water and gravity have been the prime architects of this land, sculpting layers of rock into the rugged landscape it is today”. It reminded me a lot of our Grand Canyon in Arizona, but on a smaller scale. At one stop, while we were at a very high point in our visit of the park, Pat pointed out a dirt road below us that goes around a mountain. He told me we were going to go on that road when we left the area we were at. I looked down at what looked like a one lane dirt road to me, looked back at Pat and said “we are?” But I was thinking to myself “not this girl, I’ll stay right here and you can pick me up on the way back.” Then Pat laughed and said no, that road was only for the off-road vehicles. Well better them than me! One of the things that always amazes me when I visit areas like this, is how some trees seem to be growing right out of solid rocks. I captured a picture of a tree that was doing just that. 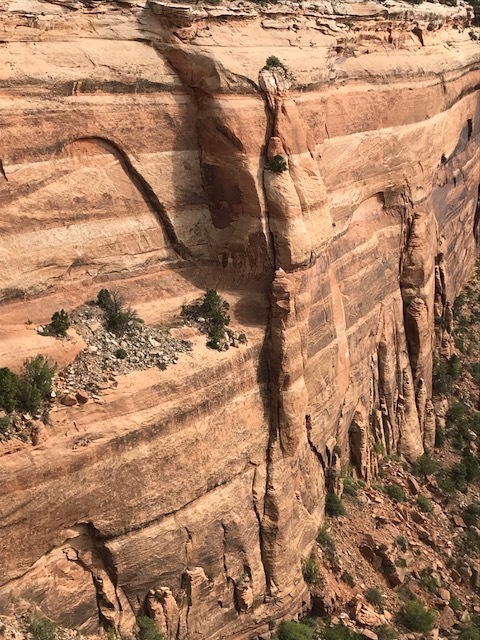 There is a huge rock/cliff and a tree is growing right out of the rock. 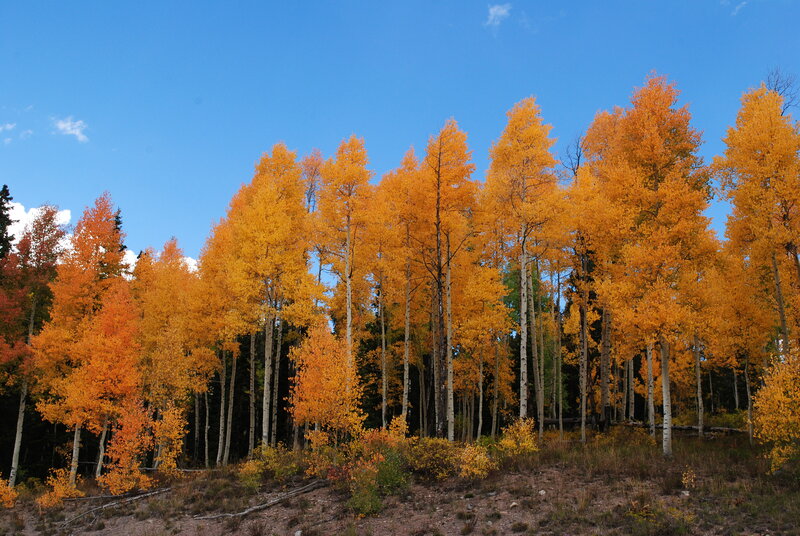 These particular trees don’t seem to need much soil to grow, and they are beautiful. 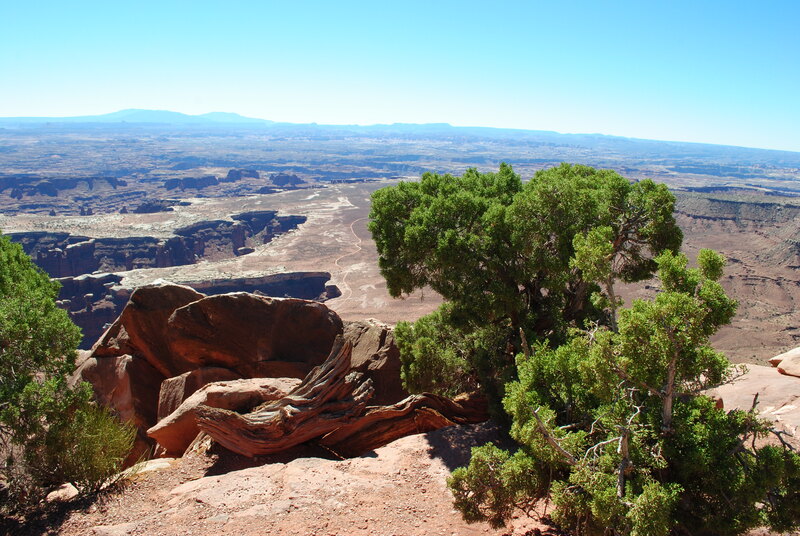 As we made our way around the scenic drive of Canyonlands National Park, each stop we made to take in the view was more spectacular than the last. It was truly hard to say what part of the park was my favorite. 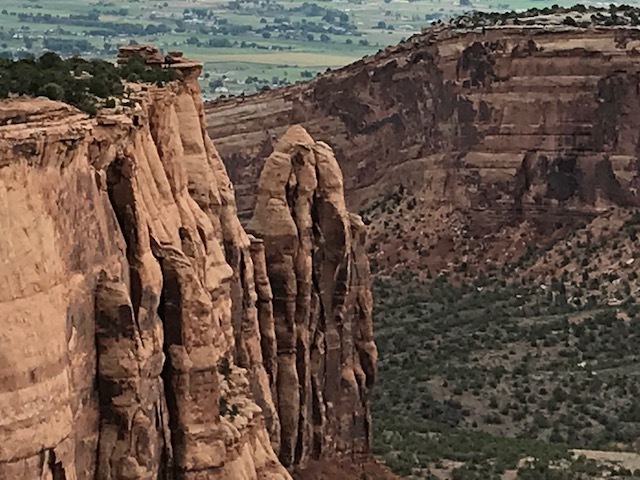 The next picture shows high spires that start wide at the bottom of the canyon we were looking down into, and they taper off into pillar shapes at the top. 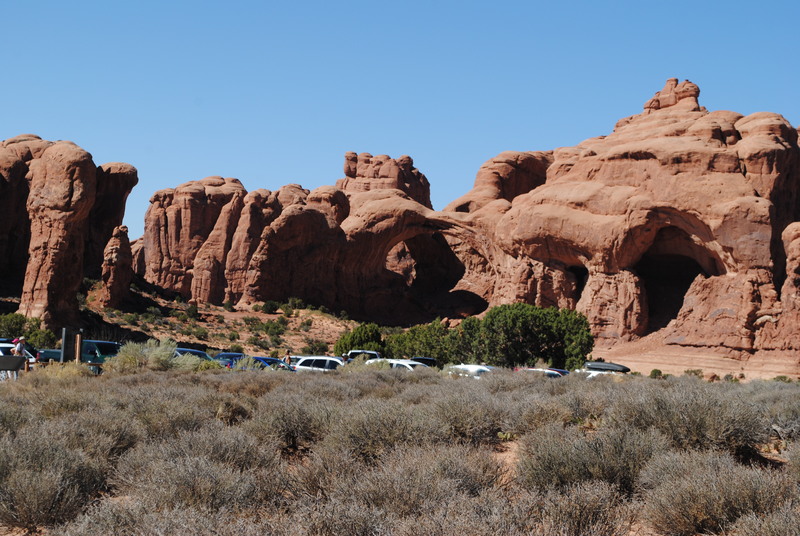 We didn’t go all the way through the park, because Pat and Celina also wanted to show us as much of Arches National Park as we had time for. They needed to get back home at a reasonable time and get the kids from the sitter. 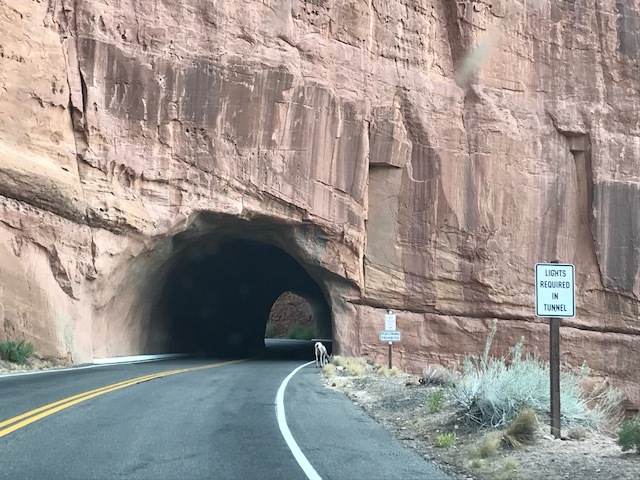 So we left Canyonlands National Park, went to lunch at the brewery in Moab (thanks for the tip Mary) and made our way to Arches National Park. 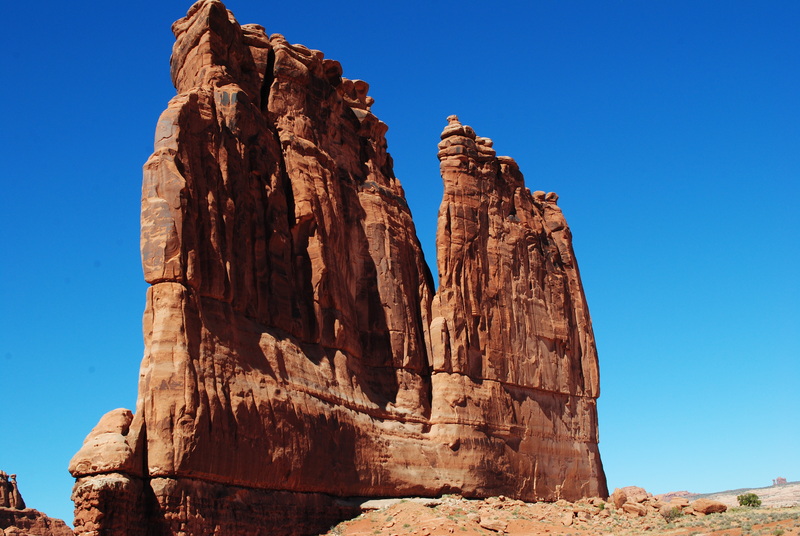 One of the first things we saw as we entered Arches National Park was the courthouse towers, which are tall stone columns that in this case, look like what would be on the front entrance of a real courthouse.. Just amazing. 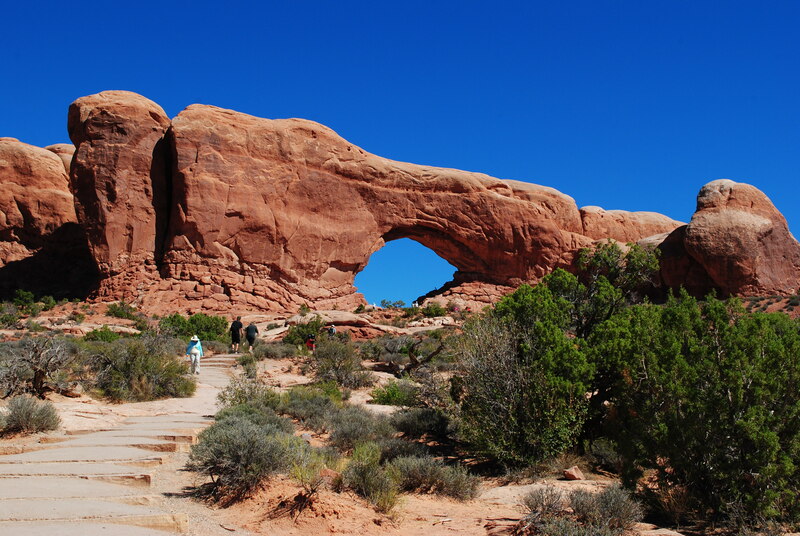 and still others have windows, or arches, carved into them from years of wind carving holes into the rock. 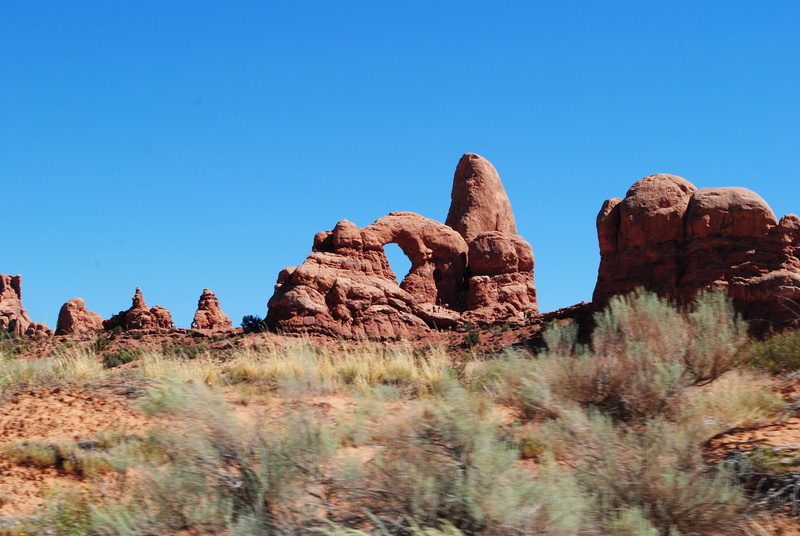 As time was running short, we didn’t get to go through all of Arches National Park either. 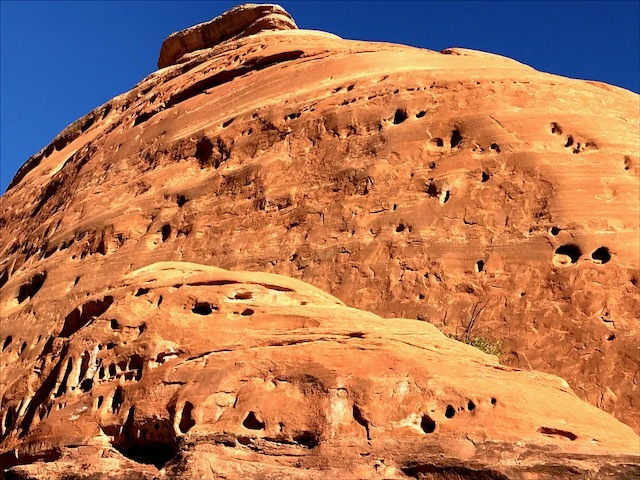 Pat said we went through about half of both Canyonlands National Park and Arches National Park, but it was enough for us to get a good idea of what both parks offer. Both parks are amazingly beautiful while being very different. We did get to see on of the larger arches or windows, and Celina and I did climb up and into the hole that makes the arch or window. 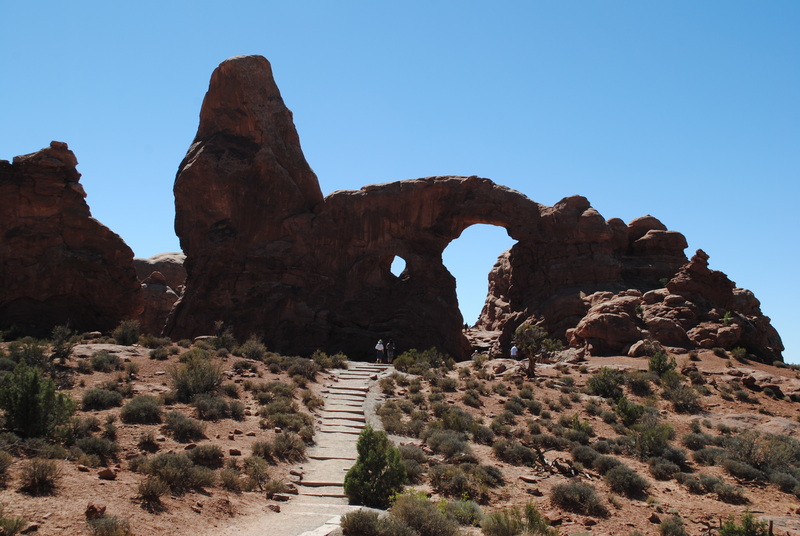 Then we made our way down from that arch, and on to the next one that had one large arch or window and another much smaller one carved out of the same rock. 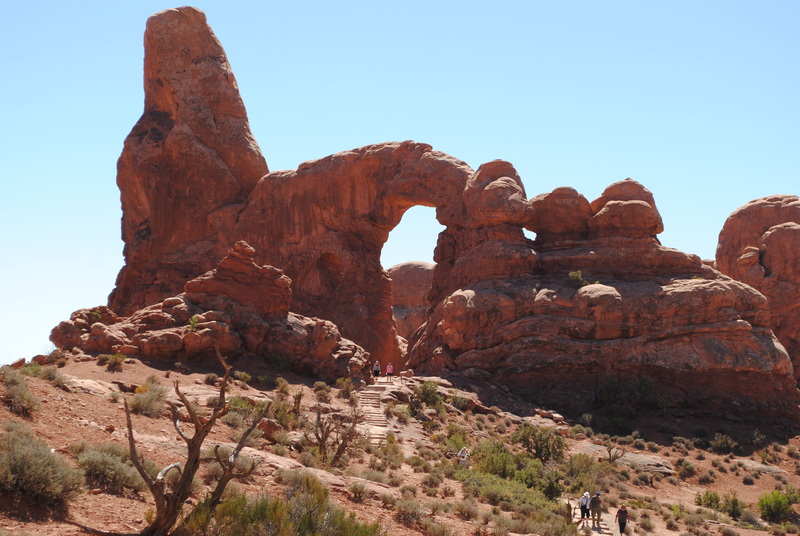 The next arch formation had a rock sitting to the side of it at the entrance of the arch, and that rock had three other rocks on it that to me made it look like people who might be the gatekeepers of that arch. 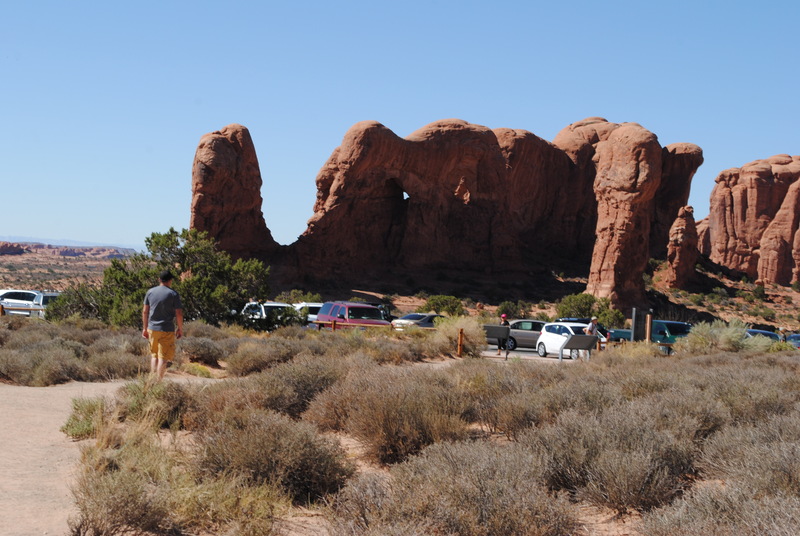 As we made our way back to the parking lot, from a distance, you can see several more arches carved into a huge rock formation making it look the entrance to several caves. 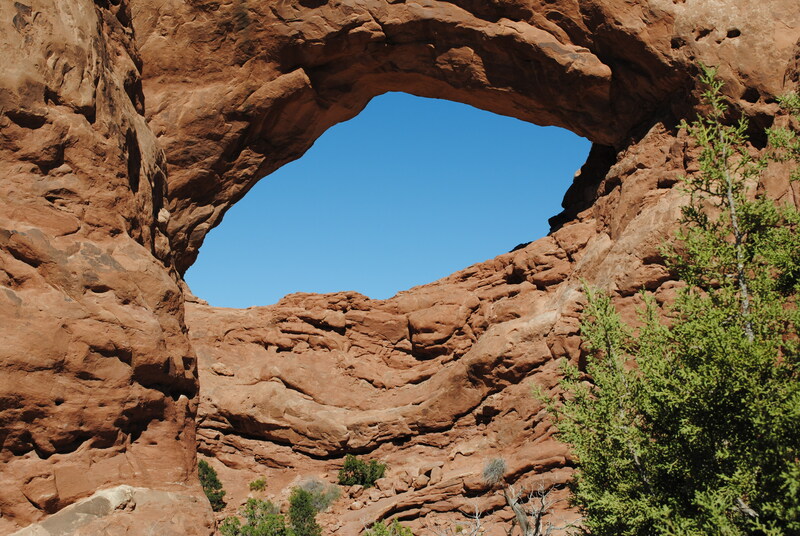 And just to the side of that was one last rock formation with two small arches or windows, but to papa and I, the large rock formation looked like two big elephants. One laying down with its trunk up in the air, and one standing behind that one with its trunk pointed down towards the ground. 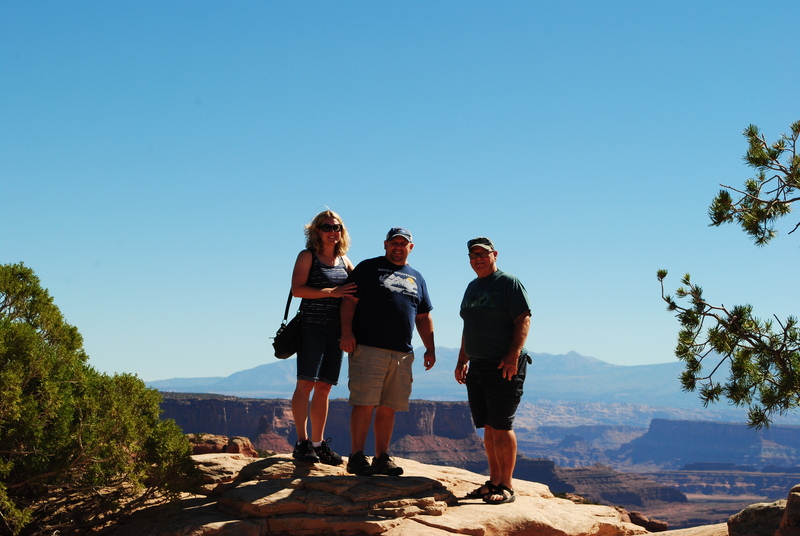 It was a beautiful fun-filled day, and we so appreciate Pat and Celina spending the day showing us around these two amazing National Parks. 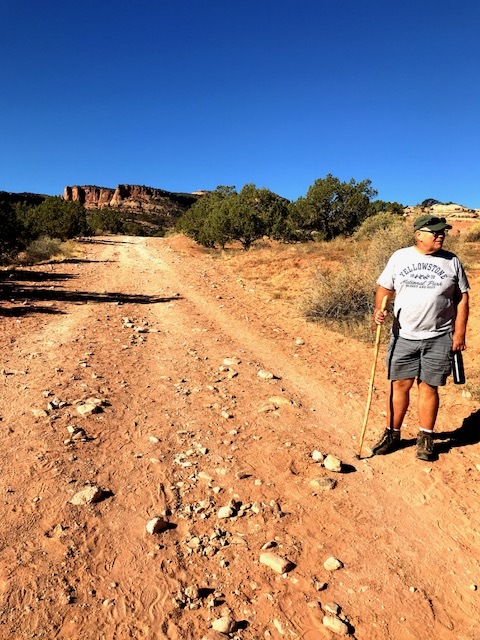 This morning Papa/Bill and I visited the McInnis Canyons National Conservation, Kodels and Devils Canyon area. Today we hiked the Devils Canyon Trail. A beautiful hike filled with amazing views around every curve. 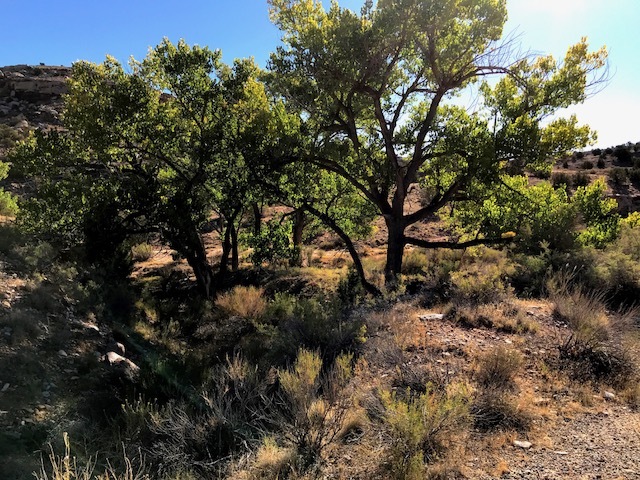 This was the perfect hike for us today, because I had already taken my two-mile morning walk, so I wasn’t looking for a long, strenuous hike. The hike started out with luscious green shade trees at the beginning of the trail. 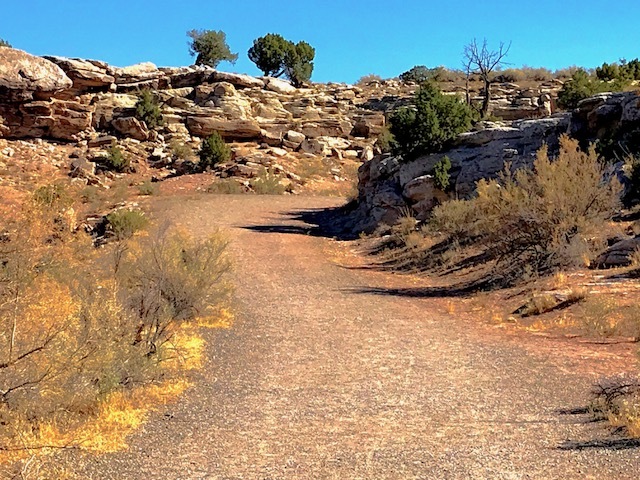 Then, the further you went along the trail, the more you are drawn in towards the amazing huge rock formations. 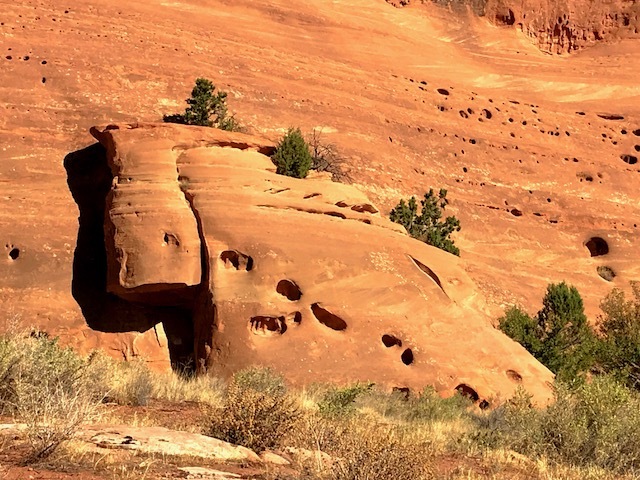 Some people love to watch clouds and see what they remind them of, we love looking at unique rock formations and try to decide what figures, faces, or scenes, they look like to us. And even if you don’t see any faces, figures, or scenes, the beautiful multi-colors within the rocks are amazing. 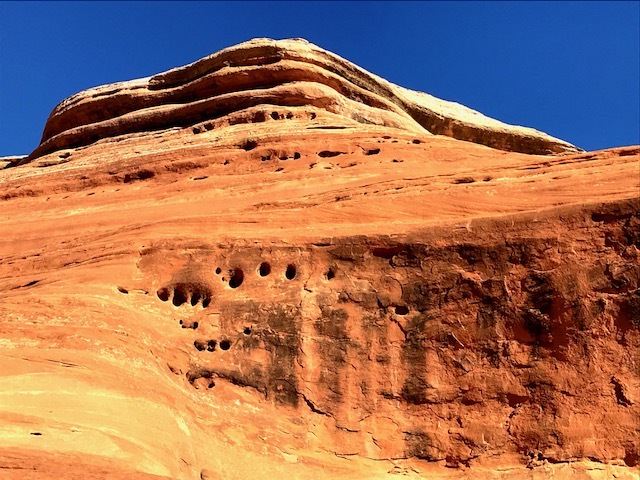 If you look closely, almost every rock tells its own story. Some look like they have eyes or faces watching you. Papa/Bill named this rock “the village people” because of the long white strips it has flowing down, formed by years of wind and water. He said it looks to him like a bunch of people, and I agreed. We didn’t come up with a name for this next rock formation, but we both thought it was very cool looking with its multi-layers at the top. It sort of looks like the top of the rock collapsed down on itself creating four separate levels. But my absolute favorite rock formation of the day, was this one that I named “rock horse”. It looks to me like the side view of a horse in a sitting position. It’s head is bent down, I can see one of its eyes, and at the top of its head, I see an ear. 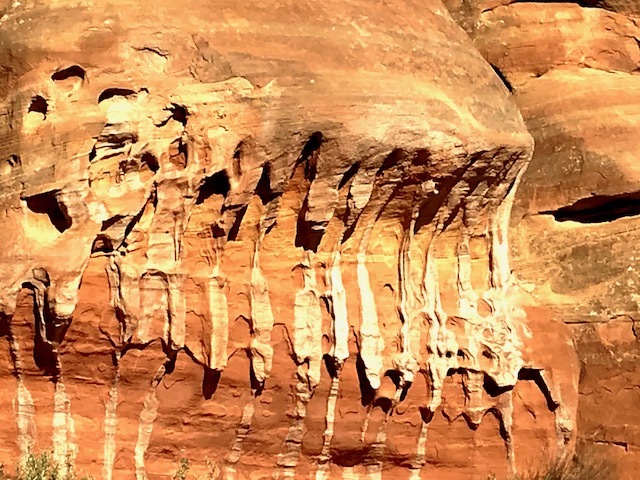 I just think it is the coolest rock formation I’ve seen yet! 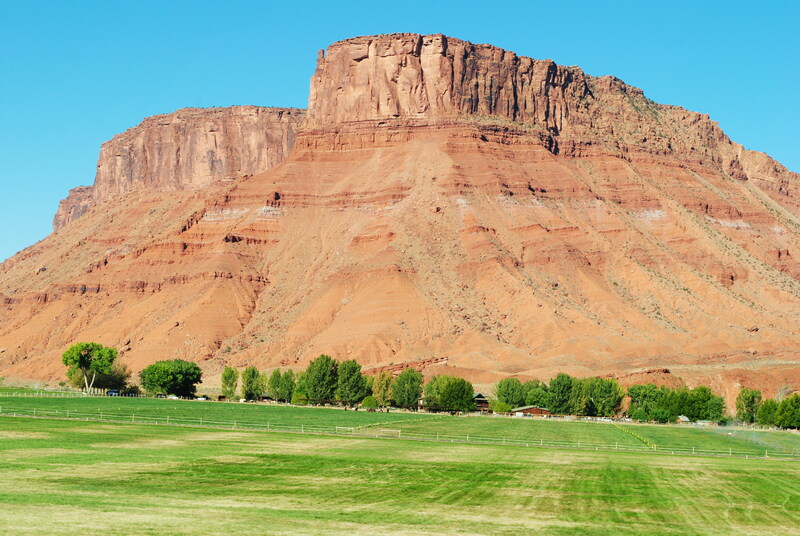 Just another fabulous day, in our temporary neighborhood, here in Fruita, Colorado. 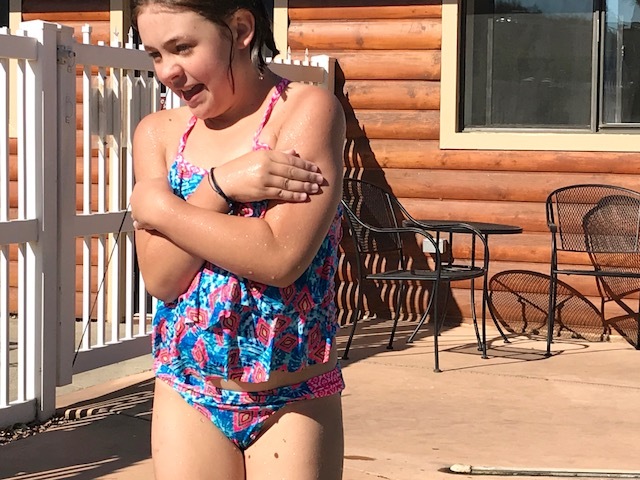 On Friday’s our ten-year old granddaughter, Hope, doesn’t have school. 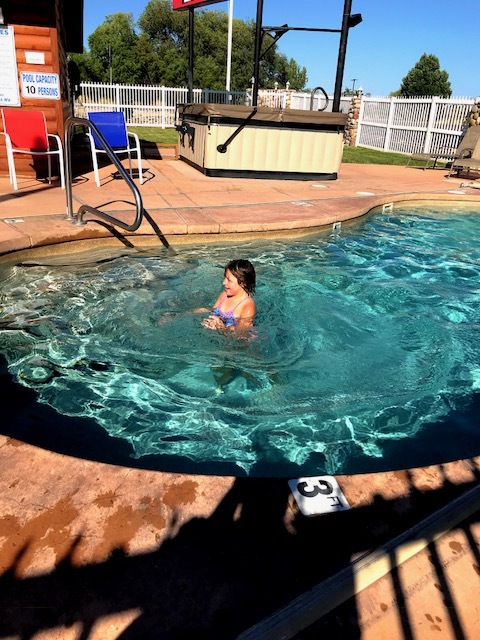 So yesterday morning, we picked her up around seven(ish), took her out to breakfast, then brought her back to our RV Park so she and I could take a nice long morning walk while we waited for the pool to open so she could go swimming. 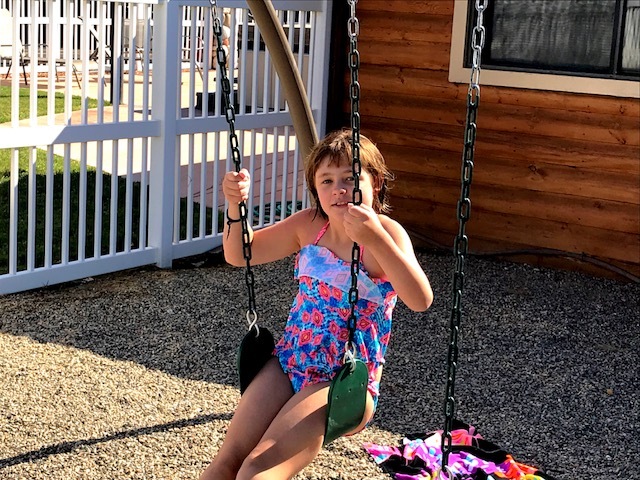 After a nice long time in the pool showing us her gymnastic skills, and having us judge her efforts, she was ready to move on to the little playground behind the pool area. This little play area really only had two swings and a small slide. But while we were there, we got to see this beautiful butterfly that came to visit the area. 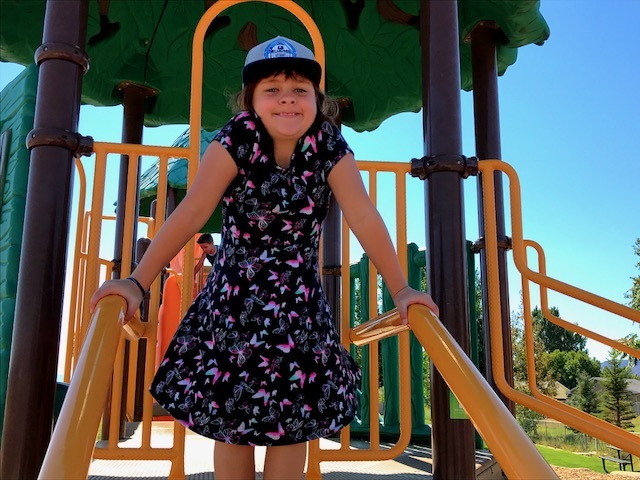 Then Hope told us about a much bigger park that was not too far away from where we are staying. So off we went to get ready to go visit that park. 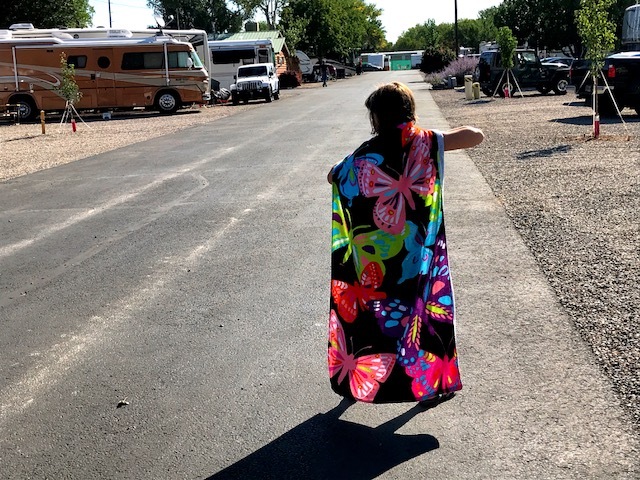 Hope was really excited, and ran ahead of us with her butterfly pretend “super hero” cape flying in the breeze. 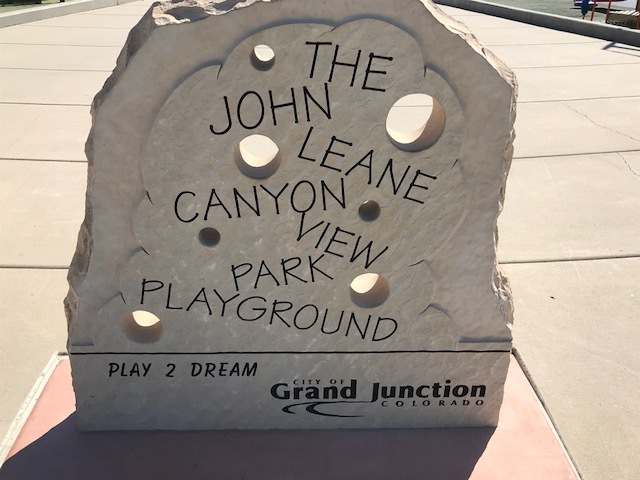 The John Leane Canyon View Park Playground was really everything Hope said it would be. 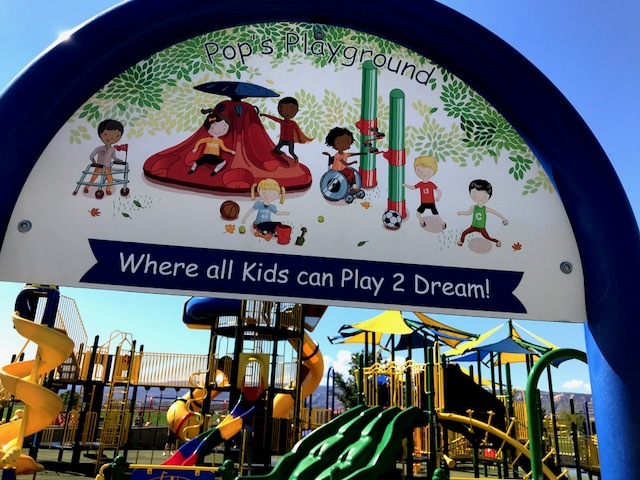 The playground has everything you can imagine to swing on. 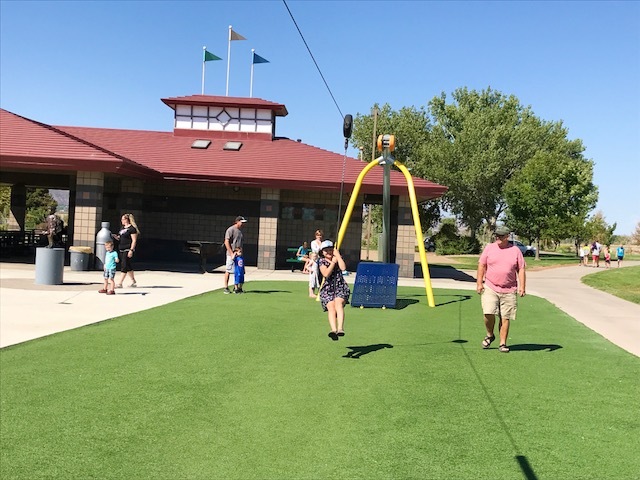 It even has a little zipline for the kids to enjoy. 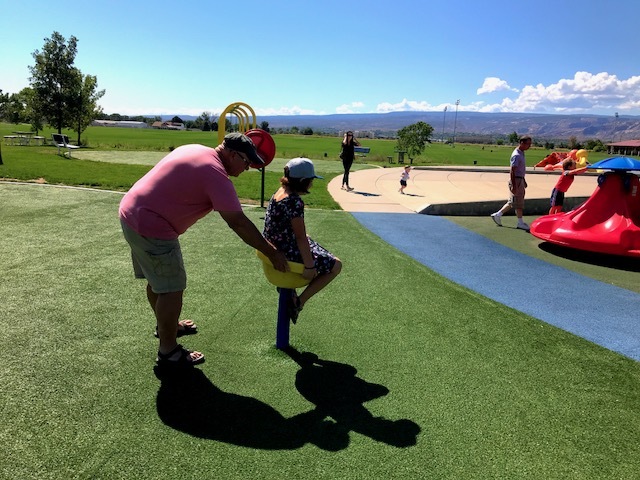 And Hope really seemed to love this little seat that spins around and makes you dizzy… She was really tickled that grandpa was so happy to push it for her to make it spin faster. 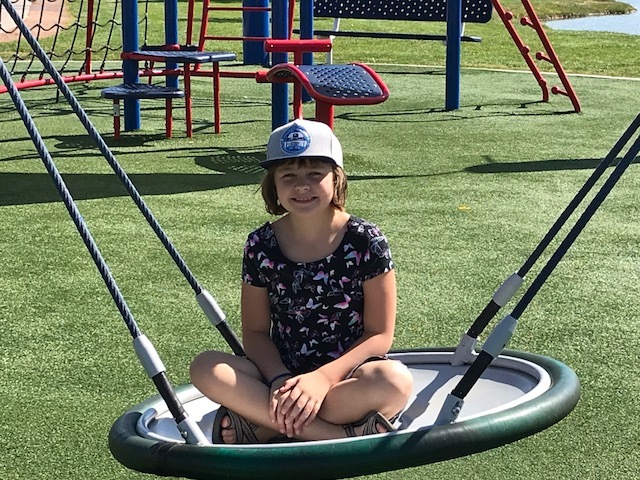 it was time to leave this nice park and take her to lunch. 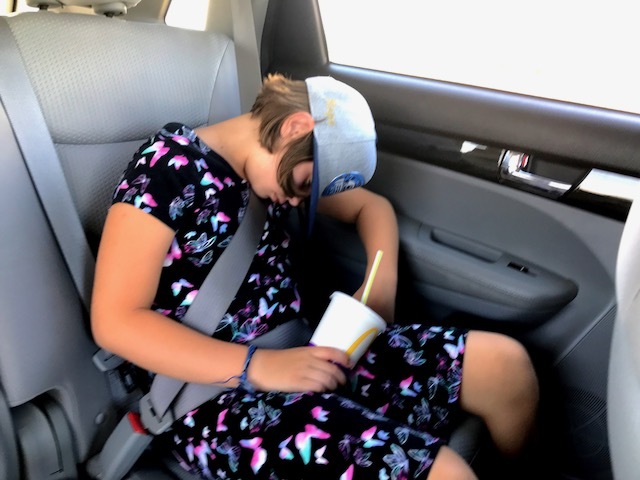 She wanted to go to McDonald’s, so McDonald’s it was! After lunch, we came home and played dominoes, and several rounds of crazy eights. 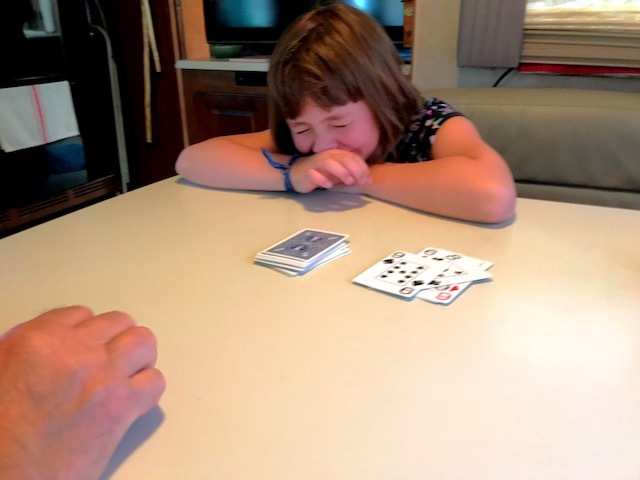 Hope got so tickled when she beat her grandpa. She laughed so hard, she had grandpa and I laughing to the point of tears. and we had a delightful, fun-filled day of Hope! 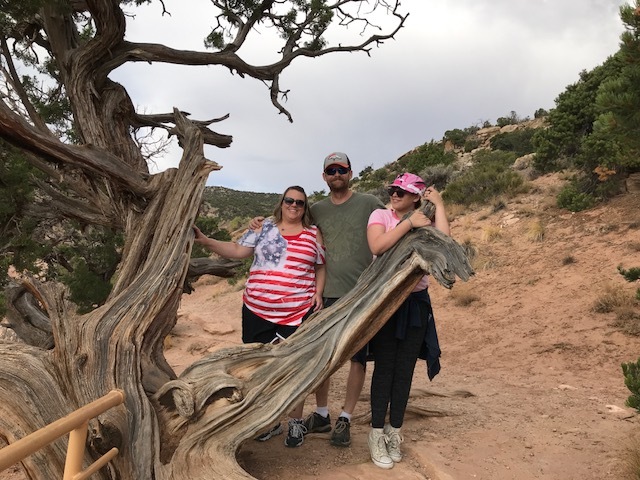 Yesterday, our daughter, Katie Roden, and her family, gave us a guided tour of the Colorado National Monument. 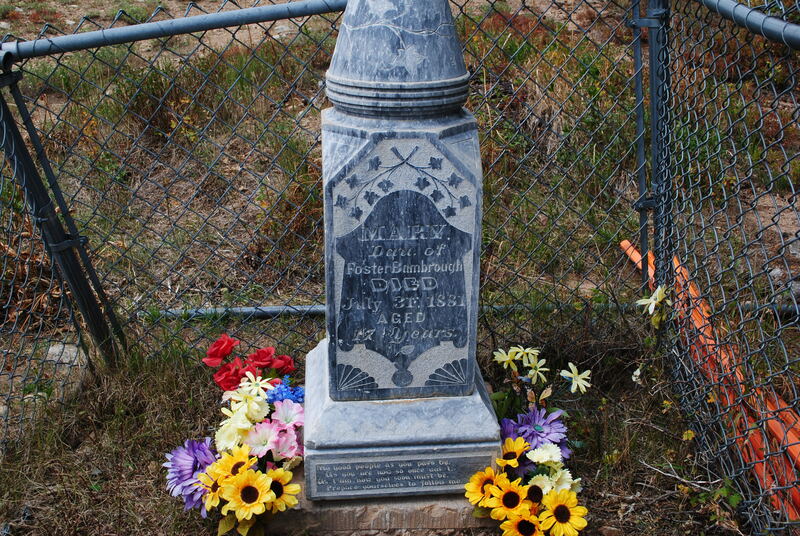 They have lived here for a long time and have visited the Monument several times and know a lot of information about it. 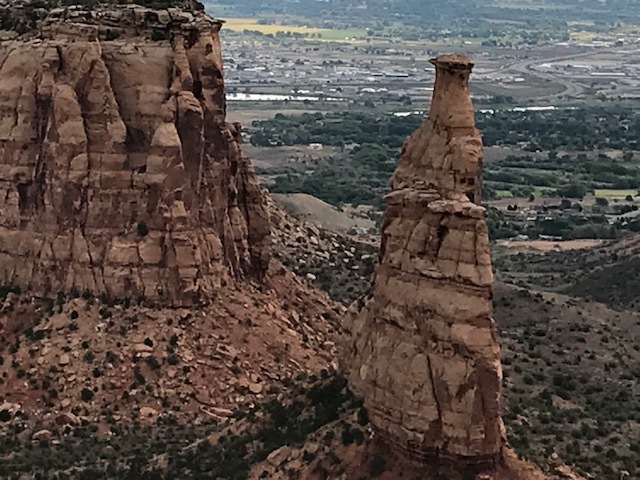 We had never been there, but it just happens to be right down the road from the RV Park where we are staying in Fruita, Colorado, so there was no way we were going to miss visiting it while we are here. 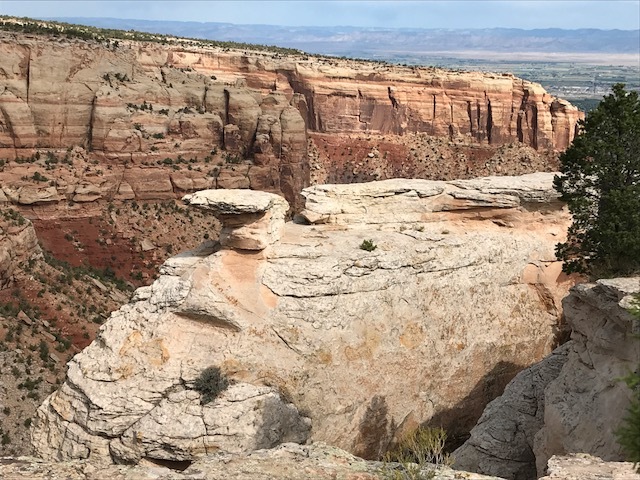 The information booklet we received when we went through the entrance says “Colorado National Monument preserves one of the grandest landscapes of the American West. 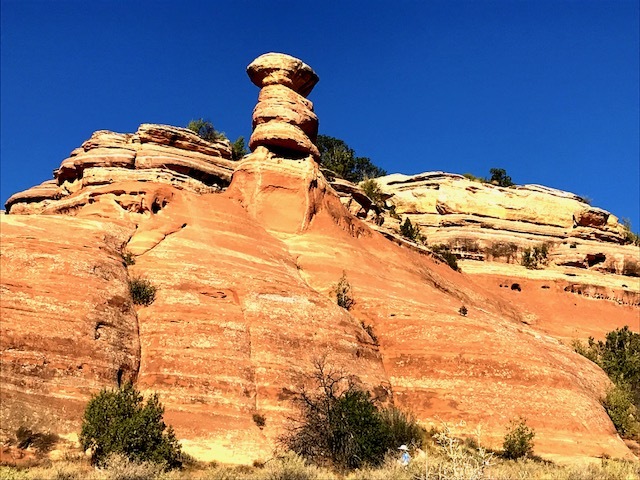 Bold, big, and brilliantly colored, this plateau-and-canyon country with its towering masses of naturally sculpted rock embraces 32 square miles of rugged terrain. 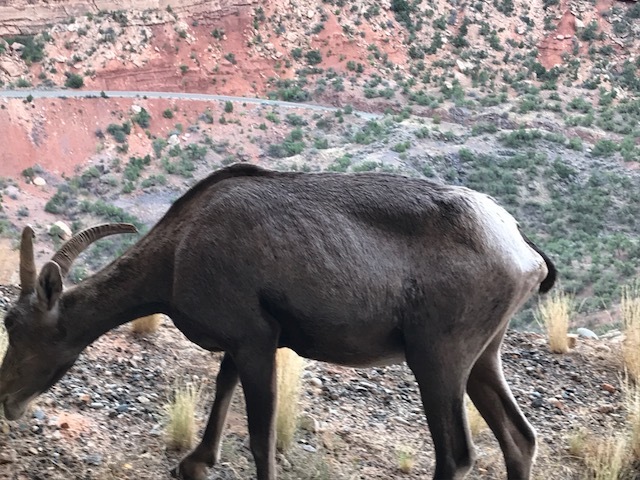 Here you can contemplate the glorious views that stretch to distant horizons, discover solitude deep in a remote canyon, and delight in wild country that has roaming desert bighorns and soaring golden eagles.” I can say that definitely describes what we saw and felt while we were there. Right out of the gate we saw wildlife just grazing along side of the road. 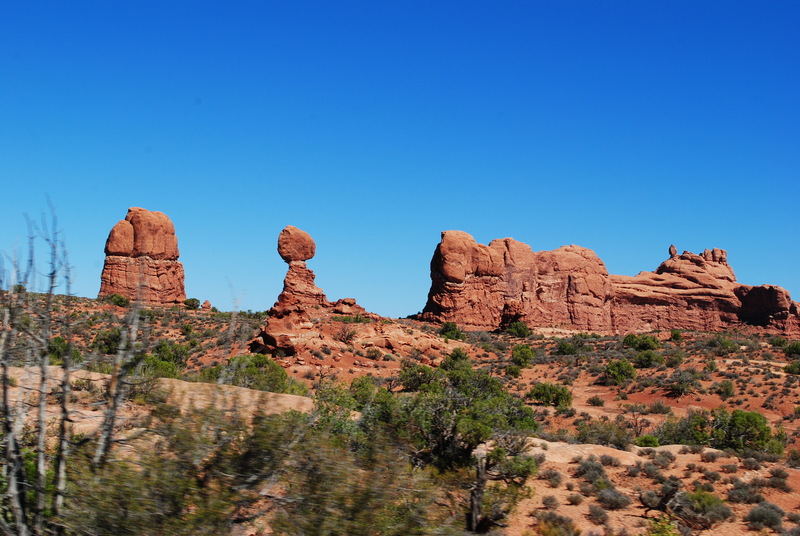 The beautiful rock formations are breathtaking. The weather was perfect for sightseeing. 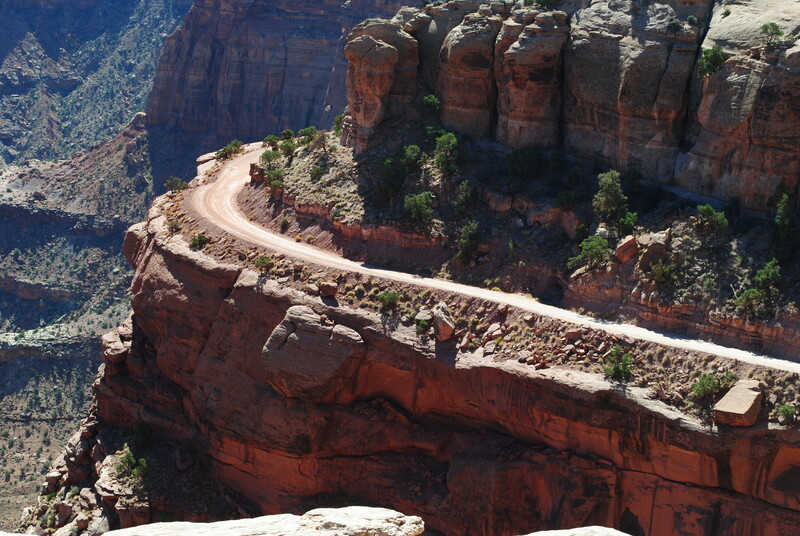 Around every curve in the road is another spectacular view. 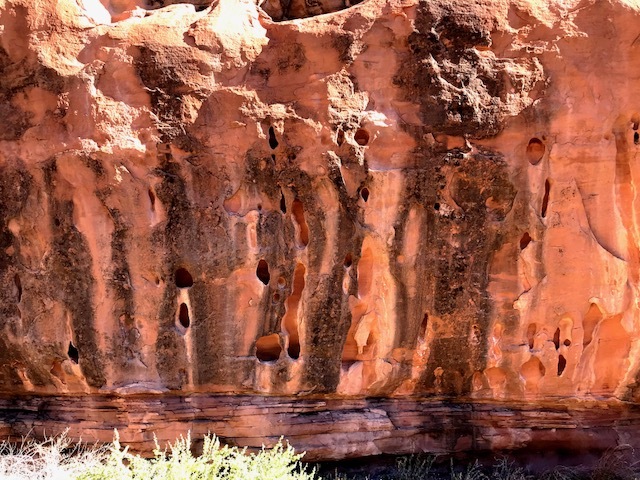 Vertical cliff walls and great natural rock sculptures tower over deep canyons. 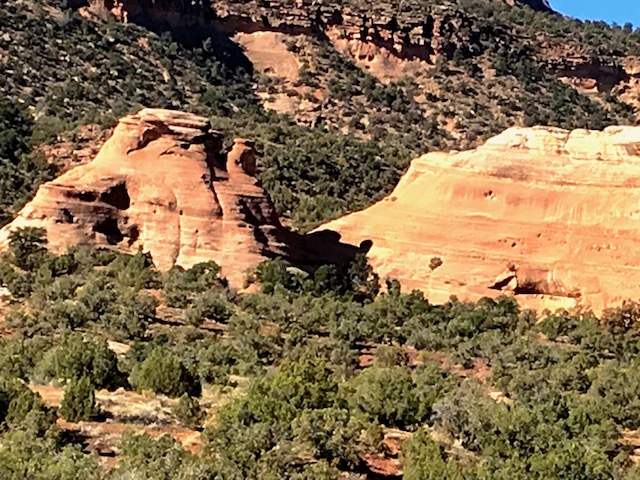 The domed rocks in this next picture are called “coke ovens” A series of colorful rock domes created by the natural sculpting forces of water, ice, and wind. I thought this looked like someone carved a statue into the wall. 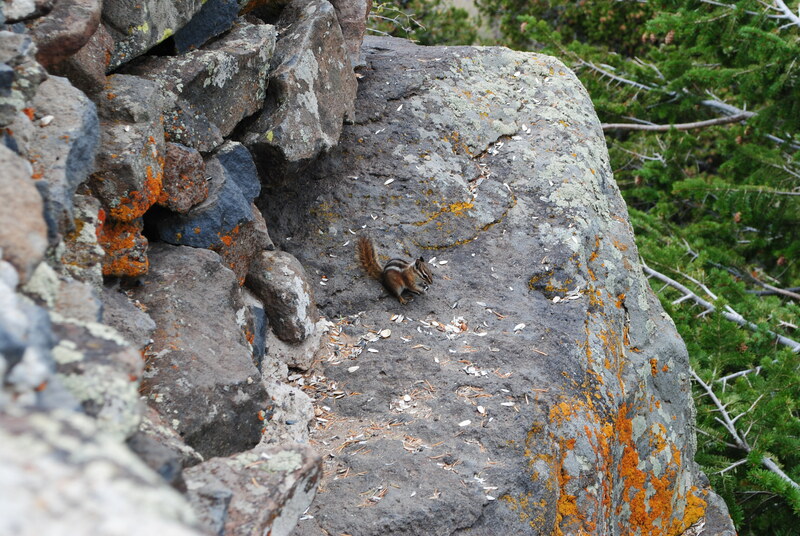 And then, you almost always come across someone that has to try to be a show-off, and take unnecessary risks. 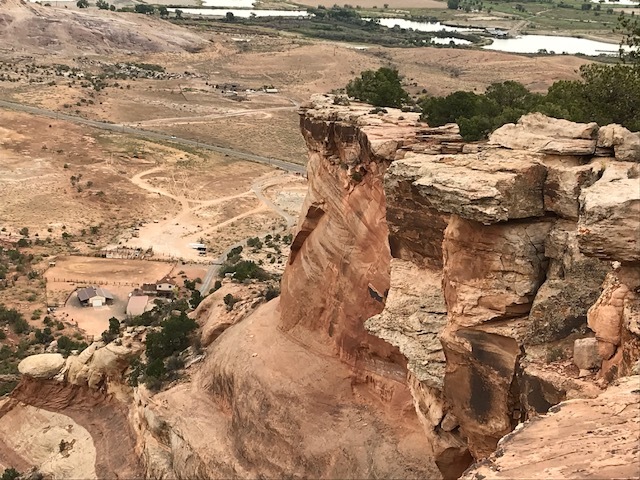 The rock that looks like it is balancing on the end of the bigger rock in this picture, had a grown man squatting down making the peace sign with his hands as he posed for a picture that was taken by others in his group. I didn’t even want to take his picture while he was out there because that, to me, would be like condoning his, in my opinion, bad behavior. 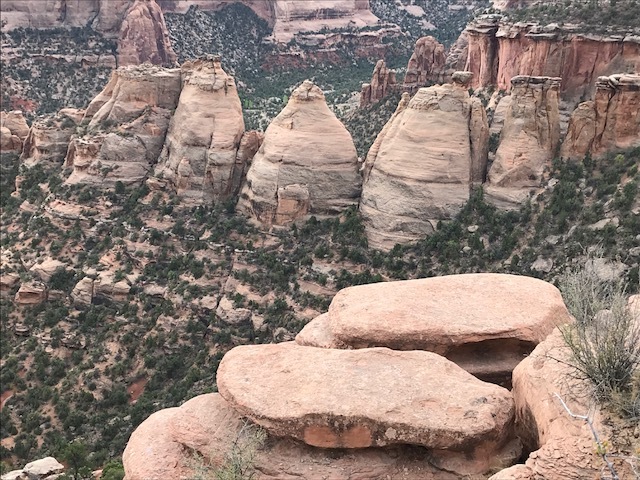 It was a fun-filled day on the Colorado National Monument with our daughter and her family. After the guided tour, we went to their house for a delicious lunch. 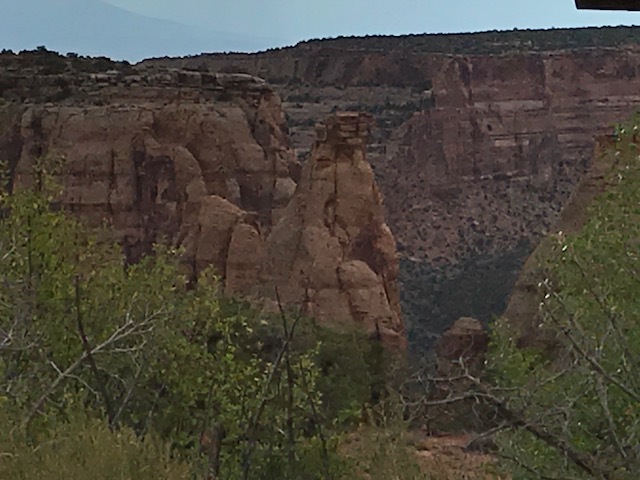 Thank you Katie, Josh, and Emma, for sharing your knowledge of the Colorado National Monument. We love you and enjoyed our time together.